Just a quick heads up to my fellow vapers...get a free 10ML bottle of Halo Cigs Cordoba e-liquid! Cordoba is one of their newest flavors and already has some really great reviews. And for a limited time you can get a free bottle of it with any order of $20 or more. 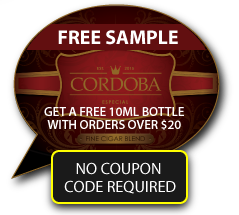 "Elegance and sophistication combine in Cordoba’s masterful blend of rich, woodsy smokiness and salty sweet caramel flavor. Enjoy the distinctive taste and aroma of your favorite high-end cigars in this refined eLiquid." Sound good? Then head on over to Halo Cigs to check it out. And don't forget to check out their other award-winning flavors. There's a reason their a longtime favorite of countless vapers everywhere.